Large 16 ounce fine bone china cup and saucer set by Roy Kirkham decorated with lots of colorful butterflies. Large 16 ounce fine bone china cup and saucer set by Roy Kirkham decorated with lots of colorful butterflies. 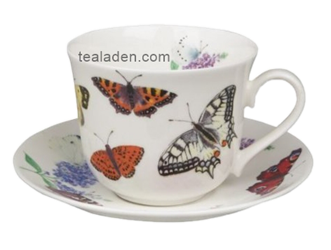 A plethora of bright, colorful butterflies flit across this extra large teacup. The matching saucer has pretty blue and purple flowers as well as the colorful butterflies. The cup measures 3 1/2" tall and 4 1/4" across top, while the saucer measures 6 3/4" across. The back stamp contains the Roy Kirkham name, fine bone china, and England. Butterfly Garden large bone china breakfast cup and saucer by Roy Kirkham. This is a first run breakfast cup and saucer as opposed to a second that can contain flaws in the shape of the cup and saucer and/or the decoration. Most bone china seconds are found on discount websites and online auctions. Several processes are involved in the making of fine bone china, but the ingredient that sets it apart from porcelain is that bone ash is added during the manufacturing of the piece. This makes the piece lighter and more translucent than porcelain.